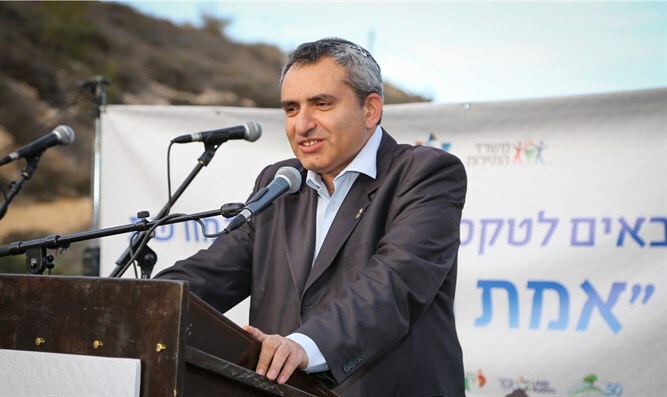 Jerusalem Affairs Minister Ze'ev Elkin said that Israel needs to acclimate the international community to the idea of Israeli sovereignty over Jerusalem, Judea, and Samaria following US President Donald Trump's decision to recognize Jerusalem as the capital of Israel and to relocate the US embassy in Israel to the capital. Minister Elkin said in an interview with Arutz Sheva that Trump's speech recognizing Jerusalem "has the meaning of a statement by the world's greatest superpower and a recognition of the simple reality that Jerusalem is the capital of the State of Israel, and no president has done so before Trump, so it certainly has significance." "What affect will this have on history? History will be the judge of that, and it is too early to make comparisons with the time of Cyrus the Great. You see this as something that requires congratulation but not thanks? "After the speech, when I formulated my response, I remembered Rabbi Kook's famous response to the Balfour Declaration, and I think that is the proper response. Rabbi Kook at the time, after the Balfour Declaration, said: 'I do not thank Britain for its statement, I congratulate Britain for the great privilege it had to make this declaration.' I think that's true in this case as well. We certainly need to congratulate the President of the United States for the great privilege that he has been given to become part of this amazing process of the return of Israel to Zion." Are you optimistic about the declaration of the transfer of the embassy? "I was glad that he had made a clear statement that the State Department had been instructed to begin transferring the embassy, ​​and it is clear to us that this is not a process that takes place in a day or two, so in this respect it gave me hope that the practical process would take place. And I hope it will happen as soon as possible." Trump also spoke of the two-state solution. "It is true that unfortunately Trump mentioned the two-state solution, but he made reservations by saying that it should be acceptable to both sides, which is a major change in the American approach and the European approach that we heard this week during the prime minister's visit. I personally strongly oppose the establishment of a Palestinian state, and do not think that this is a viable solution." But the prime minister's official position has not changed with regard to support for two states. "This is an official position of his own, not of the Likud movement and not of the Israeli government." Former Secretary of State George Schultz said this week it was time to stop talking about a two-state solution and find a way to have one state. "If this is a matter of sovereignty, I have long said that it is time to advance the matter and try to accustom ourselves and the international arena to such a move, perhaps gradually. It will be a great challenge, but also an opportunity to build everything else. It has already been proven that the idea of two states is not only incorrect in terms of national and security interests, but also simply does not work." And how do you make the world understand that sovereignty is possible? Even after Trump's announcement, they threatened that there would be severe riots, even if the situation ended up being relatively calm. "We need to formulate a broad consensus [within Israel], just there is around Jerusalem, for the application of sovereignty, not as a final result but as a real move that can be made. For so many years we have told ourselves that this will only happen at the end of days. But we have come to realize that this is an impractical idea, and I think that if we [begin to speak of] the idea of ​​a gradual beginning of sovereignty in Judea and Samaria, the public will get used to it. "The second stage is to accustom the international community. Trump's recognition would not have been possible without the political pressure of his voters to keep his election promises. Therefore, it is very important to instill in the circles of supporters of Israel, who pressed Trump on Jerusalem, the idea of ​​applying sovereignty in Judea and Samaria. But that is still a vision for a later date. There is a lot more work to do and that is one of the challenges of this generation."